I have created a custom language pack for a texture pack currently in the making; the pack uses different weapon sprites so the pickup text had to be modified in accordance with that. At first I directly modified the Language_default.xml file found in the SFD directory, but the changes have been undone once the game has been updated. The textures weren't lost since they have been placed inside the Documents directory (using the new texture application method). 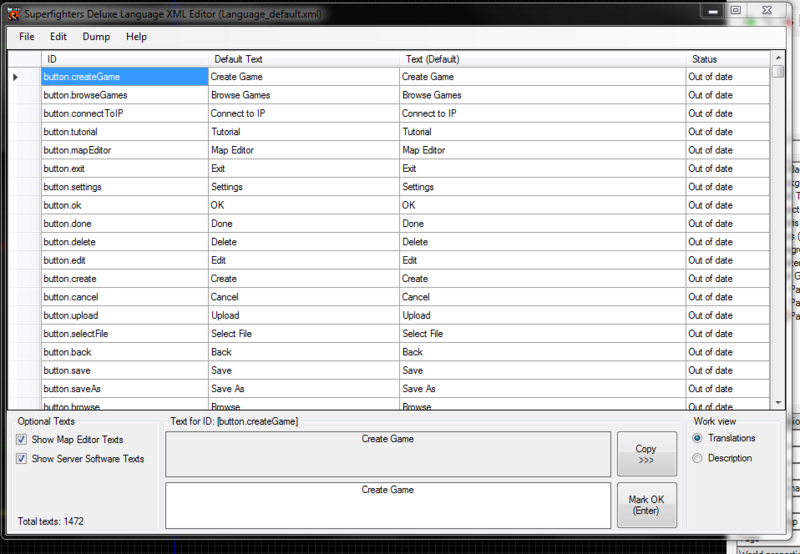 So, I figured I should create a Language_default.xml file in the Documents directory as well, that way I don't have to reapply the changes every time I update the game. I have placed the modded Language_default.xml inside C:\ Users \ MY_NAME \ Documents \ Superfighters Deluxe \ Content \ Data \ Misc \ Language. I then went in-game and selected the new language pack from the setting menu. The game has notified me that some changes may not take effect immediately so I quit the game. The note appears for quite literally one single frame and then the game loads as it does usually. Every single bit of text I changed in-game appears perfectly fine, it's just that I see this bright yellow sentence every time I open my game (which I do a lot, testing each and every texture I make) and it's very mildly infuriating me. How do I "update" my pack so this stops showing up every time I launch SFD? EDIT: To clarify, the only language category I touched was "item.X". So for example, "Assault rifle" is now "M16A1", "Carbine" is "M1 Carbine" etc. I did not modify any other category. I have kept the file named as "Language_default.xml", so maybe that's part of the issue? EDIT #2: It was the issue. Solved! EDIT #3: It was not the issue. I was bamboozled. The file name changed and it still appears in the language settings menu but the issue wasn't fixed. I still require assistance. Custom languages are entirely created using the included language tool. You can start it from the map editor under the "Tools" menu. Select "New". Name your language anything you want (but maybe not "default"). After that you only modify the texts you want to modify and override from the default texts. You should now have a few modified texts marked as "OK" and everything else as blank texts marked as "Text Missing". Restart SFD so it can properly read the newly created language file you created and select it in the settings. Restart again. Now the texts modified in your language file will override the default texts. I followed the instructions and modified the default file using the language tool. The new file looks different and does work but still shows me the brief error when the game loads. I want to point out that the modified texts were shown both times, with or without the tool, it's just the error that shows up that's bothering me. EDIT: I have removed the modified language file and loaded the default one. The error now also shows up when I'm using the Default option. I have removed the file from the directory and verified the integrity of the game's files, which then redownloaded Language_default.xml. I still receive the error when launching SFD. Could the default file be damaged? EDIT #2: Loading Language_default.xml with the language tool shows all the texts as "Out of date". That is probably the cause of the error, since my modified version relied on it. The error persists even after marking everything as "OK" and saving the file to the game's directory. What the text means anyway is that the selected language has some untranslated texts or some old translated texts - buts it's OK.
We will just remove the warning entirely for the next update. If the language file work for you in-game it's working as intended.